This formula combines powerful probiotics with easily-absorbed vitamins, antioxidants, and digestive enzymes. By helping maintain a balance between ‘good’ bacteria and ‘bad’ bacteria, Nutra Thrive supports healthy digestion and higher energy levels — so your dog can live a long, happy life. This formula combines powerful probiotics with easily-absorbed vitamins, antioxidants, and digestive enzymes. By helping maintain a balance between ‘good’ bacteria and ‘bad’ bacteria, Nutra Thrive supports healthy digestion and higher energy levels — so your cat can live a long, happy life. Nutra Thrive is an advanced supplement powder — with a bacon flavor your dog will love. 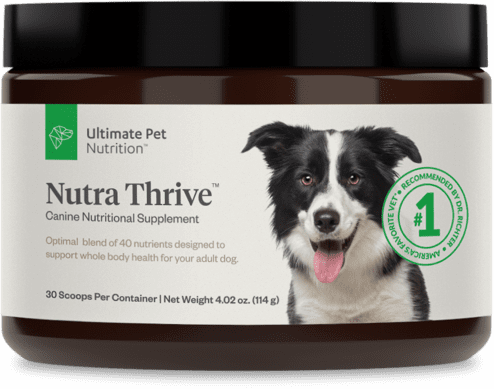 To give your dog the full benefits of Nutra Thrive, simply follow the guidelines below. Use this formula consistently for the best results. Nutra Thrive is an advanced supplement powder — with a bacon flavor your cat will love. 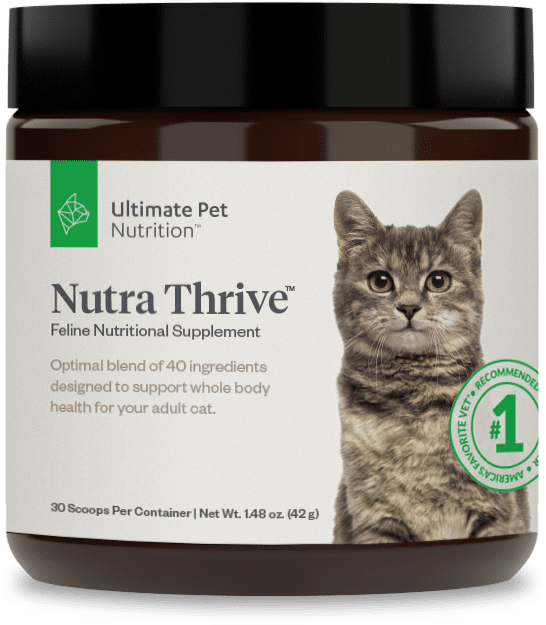 To give your cat the full benefits of Nutra Thrive, simply follow the guidelines below. Use this formula consistently for the best results. Get the right amount of dosage needed for your dog’s size. 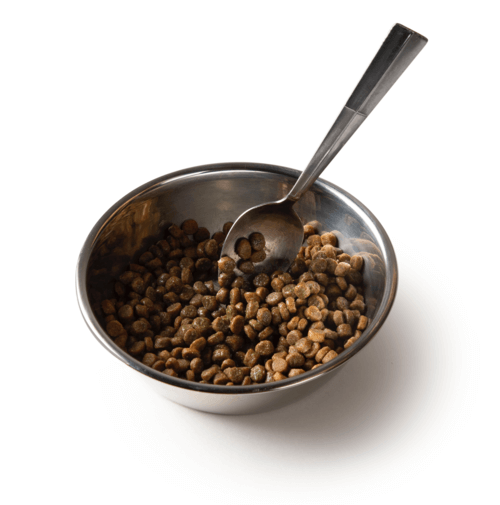 Pour the dosage onto your dog’s normal food. You may also sprinkle or pour a little bit of water into the bowl — enough to coat the kibble, but not so much that it floats in the water. About 1/4 cup should be enough. Thoroughly mix Nutra Thrive until the powder evenly coats your dog’s food. TIP: If you see Nutra Thrive powder after thoroughly mixing, add a little bit of water and repeat step 3. Get the right amount of dosage needed for your cat’s size. 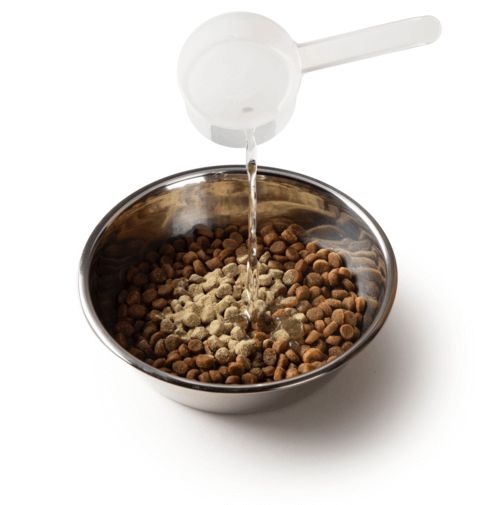 Pour the dosage onto your cat’s normal food. 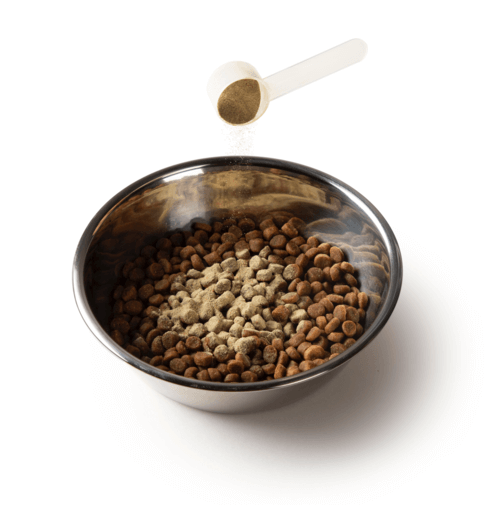 Thoroughly mix Nutra Thrive until the powder evenly coats your cat’s food. At Ultimate Pet Nutrition, we’re proud to formulate the most advanced, all-natural pet supplements on the market — which is why every purchase is backed by our 90-Day Refund Promise. If you don’t see a noticeable improvement in your pet’s health and happiness, just let us know. You can send back the unused portion, any time within 90 days — and we’ll be happy to refund your purchase price. Nutra Thrive is a bacon-flavored powder that can be added to any dog food. Each scoop of Nutra Thrive is packed with easily-absorbed vitamins, minerals, antioxidants, and digestive enzymes. The secret is in its 3-in-1 formula — Superfoods Blend, Super Canine Blend, and Probiotic-Enzyme Blend — which helps promote health and a balanced digestion. How do I prepare NutraThrive? Nutra Thrive is easy to prepare — simply follow the guidelines below. Use it consistently to get the best results. Nutra Thrive contains only naturally-derived ingredients — and each one is hand-selected for maximum quality and purity. However, we always recommend consulting with your veterinarian before beginning any new supplement. How safe is Nutra Thrive? A: Safety is our number one priority here at Ultimate Pet Nutrition, so all of our products go through rigorous testing for quality, purity and potency at an independent, 3rd-party facility. Absolutely. 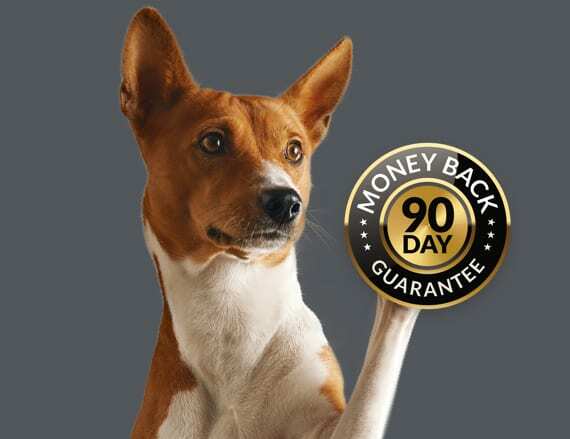 At Ultimate Pet Nutrition, we’re proud to formulate the most advanced, all-natural pet supplements on the market — and that’s why every purchase you make is backed by our 90-Day Refund Promise. If you don’t see a noticeable difference in your dog’s digestive health, please contact our Customer Support and a representative will be happy to assist you with the return. Nutra Thrive is a chicken-flavored powder that can be added to any cat food. Each scoop of Nutra Thrive is packed with easily-absorbed vitamins, minerals, antioxidants, and digestive enzymes. 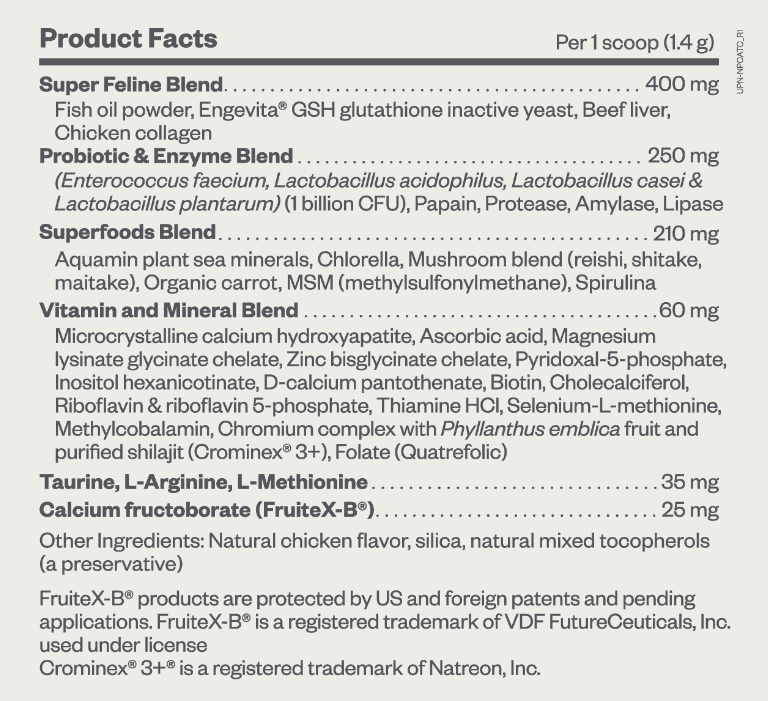 The secret is in its 3-in-1 formula — Superfoods Blend, Super Feline Blend, and Probiotic-Enzyme Blend — which helps promote health and a balanced digestion. 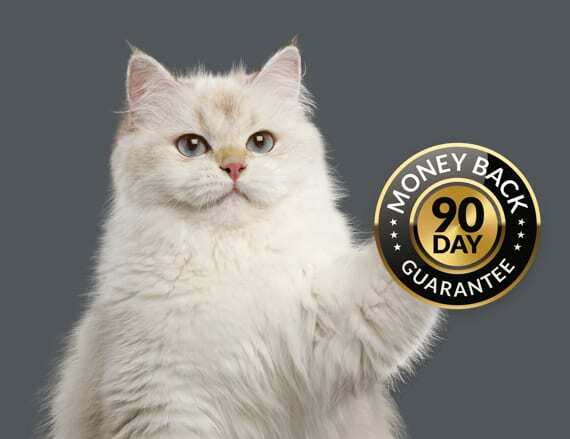 If you don’t see a noticeable difference in your cat’s digestive health, please contact our Customer Support and a representative will be happy to assist you with the return. I have noticed that my two boys (brother cats age 7) are somewhat livelier and more energetic. They are bounding around sometimes and seem to want to play more. I’ve been giving them the product for about 5 weeks, not a full scoop a day yet. They like the taste of it. 4 out of 5 Soft, smooth coat! What I’ve noticed is that my cat’s coat is softer, like when she was younger–she’s 18 years old now. And she seems to be shedding less. She is finicky about flavors, but she had no problem eating this mixed in with her wet food.